First, a story. Way back when I was much younger and James Madison was President, we were visiting my grandmother in the northern part of Michigan, in the lower peninsula. It was a small town (still is), and there was a parcel of land behind the house, just a field. This bored child went a-wandering. There was some activity from a killdeer, making all sorts of racket and playing at having a broken wing. I'd heard of such shenanigans to protect the young'uns, so I went in the opposite direction. I could imagine the call of the killdeer as saying, "Fleeee, baby! ", and I found the little ones in the tall grass. Had sense enough to leave them alone. Other birds that lay eggs on the ground do this broken wing business as well, including the star of today's show, the ruffed grouse. They're not very big, and both man and beast consider them good eatin'. How can they keep from going extinct in a hurry? The Creator gave them several ways to stay alive, including laying a passel of eggs, the broken wing trick, warning sounds, and other methods. The North American ruffed grouse (Bonasaumbellus) is common to northern USA, southern Canada, and central Alaska. Bonasa is Latin for ox (cf. Bison bonasus, the European bison). Some writers feel that the term refers to the drumming sound the bird makes which, to some, might sound like a bellowing, or even stampeding, bison. Others have suggested a resemblance of the startled grouse’s wild initial flight to the action of a charging buffalo. The species name, umbellus, means something that shades (e.g. an umbrella). During the courtship display, the male raises his beautifully banded, 18-feather tail and forms it into a fan. At the same time, he elevates the feathers around his neck, making them look like a collar (or ruff). 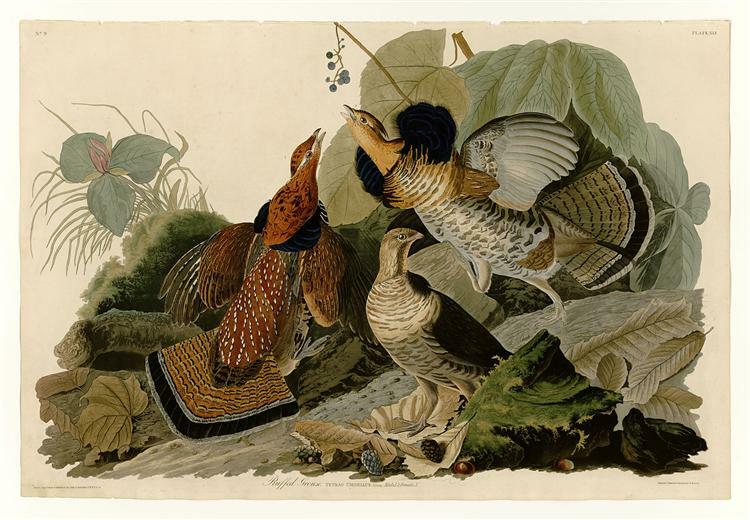 Don't grouse, you can read the full article in context by clicking on "The remarkable ruffed grouse".